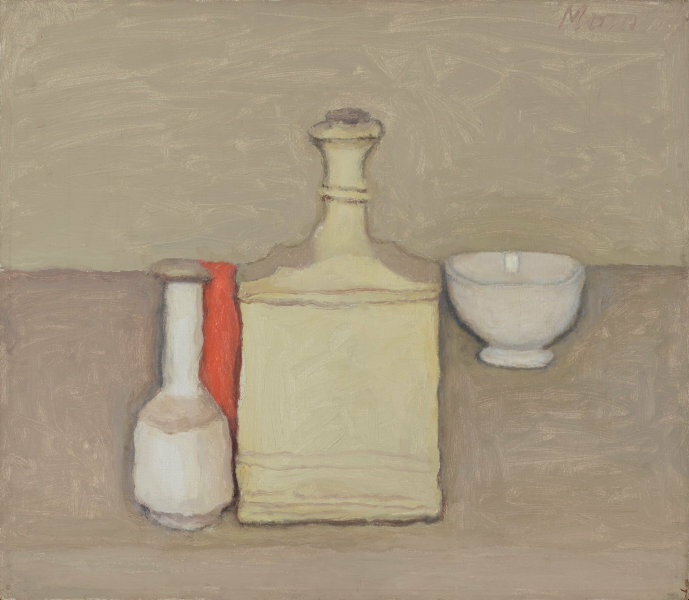 A reticent and quiet man who eschewed the successive fashions of European modernism, Morandi devoted his artistic career to the unhurried contemplation of the objects and landscapes of his native Bologna. The objects he painted and drew were invariably prosaic. Morandi gathered them together into intimate clusters. An unerring judge of proportion, he imbued these compositions with an extraordinary sense of unity, realising the lyric possibilities of his objects through subtle intervals of colour, tone and space. The familiar forms of jars and pots are simplified, yet their essential qualities seem to be heightened. In this way Morandi suggests an abstract monumentality: a characteristic associated with metaphysical painting. The classic composure of Morandi's work depends on a technique that leaves nothing to chance or improvisation. Signed u.r., grey oil "Morandi". Not dated. Gino Ghiringhelli, Milan/Italy, Owner of the Galleria del Milione in Milan, Ghiringhelli acquired the painting directly from Morandi. Galleria della Scudo, Verona/Italy, Acquired from Verrando in the mid 1980s. John Berger, Art Monthly Australia , 'How is it there? An open letter to Marisa', pg. 15-20, Canberra, Sep 2000, 19 (illus.). Edmund Capon, Art Gallery of New South Wales annual report 1998 , 'Director's Statement', pg. 7-8, Sydney, 1998, 7 (colour illus.). Bruce James, Art Gallery of New South Wales handbook , 'Western Collection: Paintings and Sculpture', pg. 17-77, Sydney, 1999, 67 (colour illus.). Look , 'The Timelessness of Giorgio Morandi - 'Still Life' (1957)', pg. 13, Heidelberg, Apr 1998, 13 (colour illus.). Giorgio Morandi the master of 20th century Italian painting , Sydney, 1997, back cover (colour illus. ).